Until recently, meditation was a very fuzzy concept to me. Growing up in a pretty homogenous, East coast suburb, I never knew anyone who meditated. My understanding consisted of abstract and puzzling instructions, like ‘sit, quiet your mind, and think of nothing.’ “Nothing! Why would you think of nothing?! What a waste of time,” I thought. Hence, meditation wasn’t at the top of my list of things to try. But I felt a bit stuck in life. While I had many happy parts of my life, I didn’t feel a baseline of contentment. External things would unglue me more easily than I would like, and negative thoughts and emotions would too often creep into my mind. I had no idea how to feel more consistently content, but I thought there must be a way. I tried many things to find a more peaceful state - including sheer willpower, increasing positive experiences or things around me, and other self-help strategies. Some of these things provided small gains, but the results were fleeting. After moving to California, I started to meet people who practiced meditation. Something was different about their disposition. They seemed calm at their core, and imbued with a kind of grounded optimism. Sensing that this might be what I was missing, I asked about their experiences with meditation. They described their discovery of meditation as a pivotal experience in their life. “Maybe this is not such a waste of time after all,” I thought. I find that when people describe experiences as life-altering, even if I don’t understand why, I must learn more. Similar curiosities led me to study aboard in college and volunteer in Africa. People said these experiences would change me. Maybe they even described how, but I didn’t fully understand until I went myself. Still unsure about exactly what meditation was, I dove in. I registered for a 10-day silent meditation retreat. While this was still months away, I realized that I should start learning about what I signed myself up for. What is meditation? I asked the friend that recommended the retreat and about how to prepare. She suggested a book, Turning the Mind into an Ally, by Sakyong Mipham (2003). I didn’t get too far into the book before realizing that it was a very concrete and practical explanation of meditation. It explained that the mind was like a wild horse and you were on its back. Without awareness of this arrangement, let alone training, the wild horse/the mind would go wherever it wanted to go, and you had no choice but to come along for the ride. My mind would lead me through negative thought patterns and harmful emotions in response to relatively minor stimuli, and I was just an oblivious passenger trying to hold on. As the book explained it, the promise of meditation was that with consistent practice you could learn to lead the wild steed. You could form a mutual relationship with the horse, but you have to patiently come to know it, and work with it to overcome engrained patterns. Like a wild horse, my mind was responding to circumstances and experiencing thoughts and emotions based on patterns I was often unaware of. Sometimes I grasped these patterns on an intellectual level, but the understanding didn’t necessarily provide me with practical tools to recondition my responses. For example, when someone would express anger toward me, I felt scared, internalized the situation to develop negative self-concepts, or struck back defensively. But this pattern, could be just that, a pattern. I didn’t have to respond that way. I could lead my mind to different reactions. I didn’t have to just remain powerless on top of the wild horse. The actual practice of meditation includes sitting silently with proper positioning and focusing your attention. This book directed me to focus my attention on breath. Anytime a thought or emotion would come up that was not breath, I would recognize that I was thinking or feeling something else and then return my mind back to breath. It was hard for me to believe that something this simple would help me, but I was determined to try it. At first, I sat on a couch cushion in the middle of my living room, and meditated for 5 minutes using my kitchen timer. At the beginning, I experienced what the book referred to as a “waterfall” of thoughts. 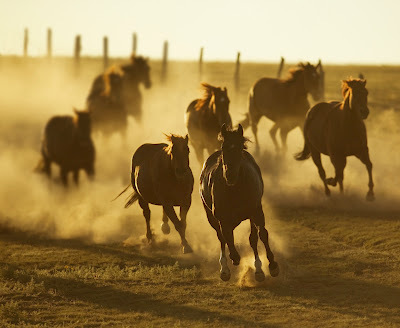 Having never tried to focus my mind on something so simple as respiration, so many thoughts poured down on me: “What am I going to have for lunch?” “What if this doesn’t work?” “I should do a load of laundry.” In these instances, the wild horse takes off. 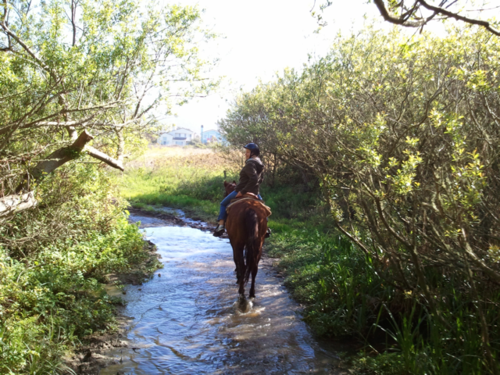 Then you have to grab the reigns, and lead the horse back to the path: your breath. The important thing is to commit to doing this, and not leave your seat until the timer goes off, otherwise the horse is in control instead of the rider. In meditation, you practice noticing your feeling and thoughts. You train in redirecting your mind rather than allowing it to be swept away. The more you practice, the more you break down the old patterns and establish new ones, improving your ability to redirect when stronger and stronger thoughts and emotions come along. It is not about purging all your desires and thoughts, but learning to react differently to them, leading to a more peaceful existence. Every other day I would add another 5 minutes to my total time. 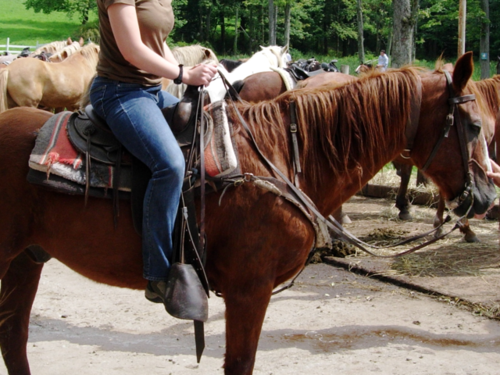 To build these skills and develop strength in leading the horse, I would have to practice regularly. Weight lifting was used as another helpful metaphor in the book; you can’t expect to walk into a gym, be able to lift the largest weight, and walk out all finished with your training. In the same way you can’t expect to meditate for a week and be able to handle your strongest emotions with peace. I noticed some immediate positive effects in my everyday life. I was able to recognize emotions more easily than before and at least be aware of them. After more practice, I was able to gain space from the emotions in certain situations. I realized that I had a choice in where to place my mind even when I was not meditating. I was able to remain calmer through difficult situations - arguments with my partner, critiques of my professional work, and small rejections from friends. With further practice, I am learning a lot more about myself and how I want to live in the world. There are many types of meditation. This is my novice interpretation of only one – mindful breathing. There is lots of nuance I have not captured here. I am just beginning to learn, and I wanted to share how I first came to understand meditation and why it was important in my life, before I deepen my practice and lose the perspective of an initially skeptical and then wide-eyed and amazed beginner. This article is posted here with permission from the author. Joanna Holsten blogs at "Let's Live Nice,"which documents her journey towards a more critically compassionate life, exploring ideas and actions for a world with less suffering and more happiness.